We loved that mini-series so much we are happy to bring it back today with more of our favorite picks from The Land of Nod! They have the most flawless assortment of beautiful children’s books and we each reviewed a few with our kids. First up: Jenna, Quinn and Jude! exciting fonts are so fun to look at for Jude and read with Quinn. This book gets read every day at our house, it’s especially wonderful because it captivates my almost two year old which can be difficult to do! 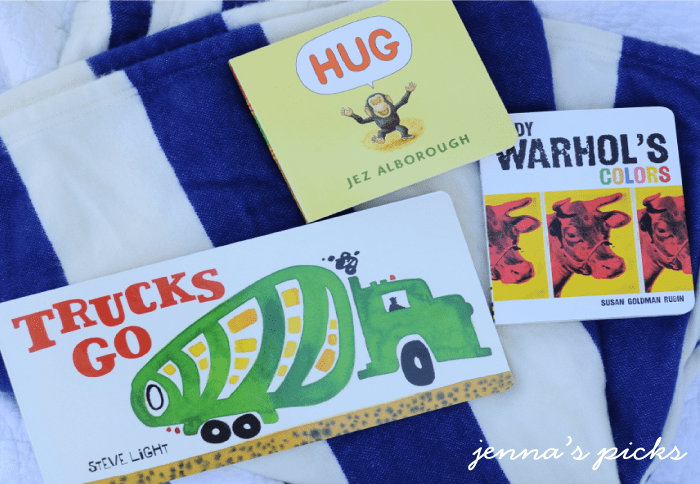 Hug by Jez Alborough is such a fun story that my four year old loves to read with me. It’s an easy read and the illustrations are darling. Who doesn’t love a story about a monkey?! Andy Warhol Colors is a wonderful twist on the typical color book. Full of unique Andy Warhol paintings, it’s a beautiful and modern way to teach your children both colors and art history! This would make a great gift and even if you don’t have children, add this to your coffee table collection. Guests will be sure to love it! Doug Unplugged by Dan Yaccarino is a story about a robot that breaks free from this daily routine of be plugged into a computer and uploading information about the world, and finds himself in the city having all sorts of new experiences he had never learned being plugged into the computer. The illustrations are incredible, and Dash giggles through the entire story, he loves having real life adventures just like Doug. I think this is the perfect way to teach kids to unplug, and that outside is full of adventures and new experiences. Spoon by Krouse Rosenthal is a story about a spoon who envies all he other utensils for all the qualities they have and adventures they get, but eventually realizes that being a spoon isn’t so bad when his mother points out to him all the things spoons get to do that knives, forks, chopsticks, etc. don’t. I love this story for kids because it shares the importance of finding the beauty in ourselves and our own talents. This is Paris by M. LASIK is one book in a series of many others (this is London, this is New York, this is San Francisco.) I have brought these books home from a few work trips/vacations whenever I visit beautiful cities. I visited Paris prior to having children, so when I saw that Land Of Nod carried it, I jumped right on This Is Paris. These books teach about the interesting facts and unique beauty of each city. Dash enjoys learning about them through Lasik’s books because of the gorgeous illustrations and the comedy he adds into his writing. My kids are obsessed with cars and trains, as so many boys are! We checked out Donald Crews Freight Train at the library and they were both mesmerized, so of it was a no-brainer to add to our collection! I love it for it’s beautifully colorful and graphic illustrations. 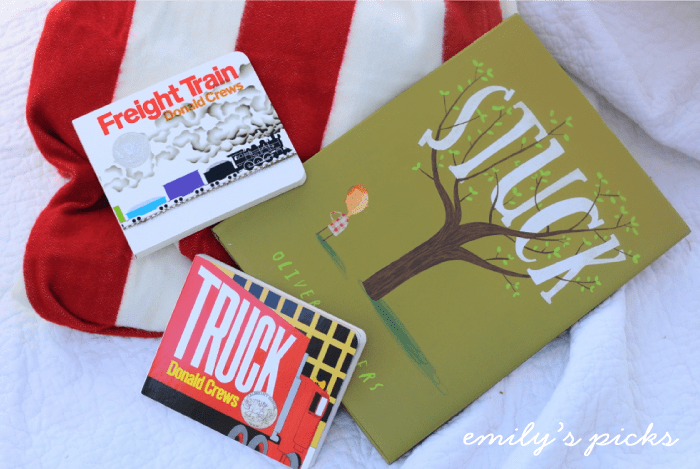 The text Crews uses makes the train come to life – you can almost hear the sounds of a train while reading – and it helped me be able to tell the difference between the different train cars which is vital for my very detail-oriented three year old! Because we loved Crews so much, we checked out Truck as well. Equally graphic and stunning, this is all about trucks and a truck’s journey. With no words, it forces you to get creative and really dissect the illustrations which is fun! Stuck by Oliver Jeffers is a treasure and I don’t use that word lightly. All about a boy who is just trying to get his kite down, so he throws whatever he can find to knock it loose. It’s silly, and beautifully illustrated, and it’s captivating for adults and kids alike. I want to live in Jeffers world, and that’s my favorite part about reading to my kids or on my own! Check out Land of Nod’s amazing library here, what books would you add to the list for us to try out? A Hole Is to Dig by Ruth Krauss. I squealed when I found it in LON’s Classics section. I love it. You will love it. Everyone will love it! A Hole Is to Dig is incredible! I love “Harlem’s little black bird”, so good and gorgeous! My boy’s favorite right now is “A book of sleep” by Il Sung Na. Simply beautiful! “How to Catch a Star” by Oliver Jeffers. Magical and sweet, a real treasure you will enjoy again and again. “Moon Plane” by Peter McCarty. Story about a boy who wonders what it would be like to be on a plane soaring above the world….story ends back safe at home, returning to his mother (love that part). I used both of these books as inspiration for my little boy’s room. I love your selections… Our favorite book is “Caps for Sale” by: Esphyr Slobodkina. It’s a book about a cap peddler and a tree full of monkeys. The repetitive text permits children to speak the lines and join in the reading experience. Always great fun! Land of Nod has such a nicely curated collection of picture books. 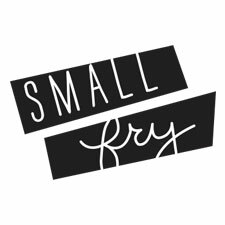 Love When You Were Small by Sara O’Leary. Amy Krouse Rosenthal’s Little Pea etc. series is hilarious and anything by Oliver Jeffers delights. Just found your blog thanks to Over the Big Moon. I am always looking for new books to read to my two small fries (4 yrs & 20 months). My 4yr old’s favorite stories come from The Brothers Grimm right now. No pictures just great storytelling.